We so love your upcoming book, No Hard Feelings: The Secret Power of Embracing Emotion at Work! Can you tell us more about it? No Hard Feelings is a visual exploration of how to bring emotion into the workplace without letting it run wild. Many offices contain so many unwritten rules that they can start to feel like emotional minefields. How much emotion can we express before we come across as unprofessional? What if our “authentic self” is overwhelmed and anxious– should we be open about these feelings? How might who we are (for example, our gender, race, or age) affect the answers to these questions? Our goal is to help you figure out what you’re feeling, why you’re feeling it, and what to do with those feelings at work. 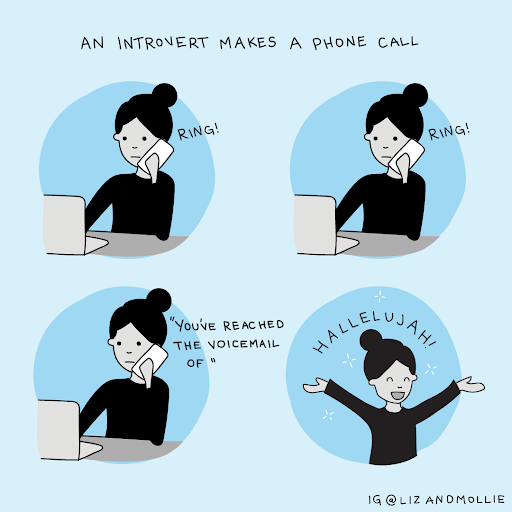 For introverts, that often means finding the right balance between respecting your need for alone time and pushing yourself to participate in important, work-related social situations. We look at specific issues introverts often run into at their jobs (like having a boss who’s guilty of MBWA or “Managing by wandering around”) and give tips you can try, no matter your role or job. We were definitely inspired by our shared experience as introverts navigating workplaces designed for extroverts. 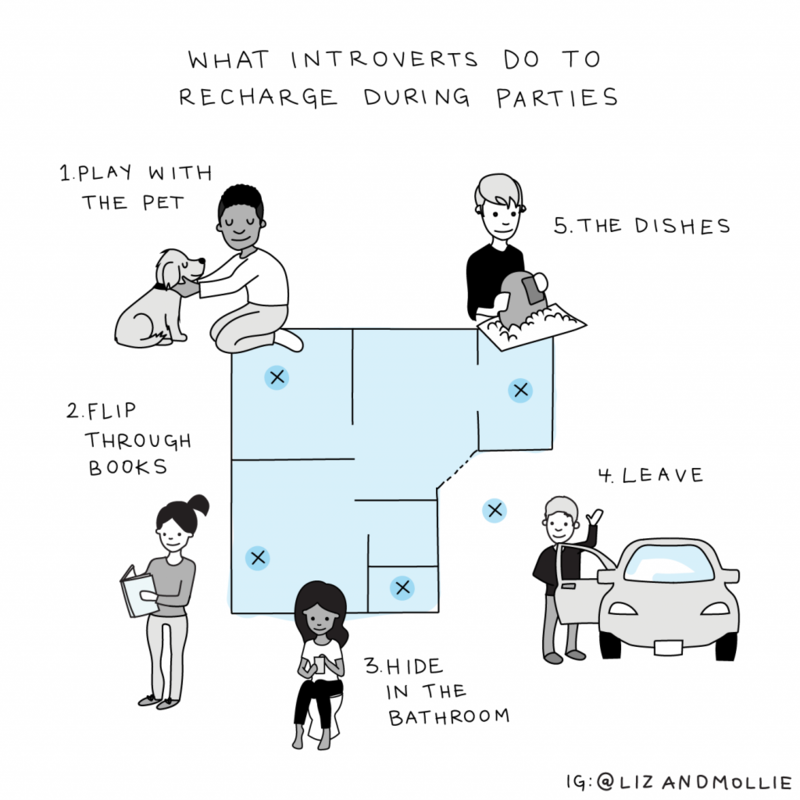 Liz: Like most introverts, I do my best work when it’s quiet or when I’m alone (one of my favorite quotes comes from the late Maurice Sendak, author of Where The Wild Things Are: “People are all […] talking on machines and twittering and twottering. All that. I’m here looking for peace and quiet.”) That said, I often have to work in noisy, open offices. Going for a quick walk or listening to white noise help, but I’ve found the best thing companies who have open office floor plans can do is designate a conference room as the Quiet Room. In the Quiet Room, you are not allowed to talk or take phone calls. You can only work in silence. This room is a blessing for introverts! Mollie: I travel a lot, which means there are days when I’m with colleagues from the moment I leave my hotel room in the morning to the moment I return to it at night. I’ve found the best offense is a good defense. I try to block off a few hours at the end of each day to step away from the group. During breaks, I’ll take a 5 minute solo walk around the block. If you don’t have breaks, talk to your manager about scheduling breaks (or if you’re a manager, schedule those breaks!). We met on a blind friend date! In late 2013, Liz, who had just moved from San Francisco to Brooklyn, asked her existing friends to introduce her to their favorite people in New York. Mollie was one of those favorite people. We just had an instant connection. We have a lot in common: we’re introverts, we’re obsessed with our sleep rituals, and we both have extremely extroverted partners. As we grew closer, we also realized we had each gone through periods where our work stress manifested as physical symptoms (Liz started getting migraines and part of Mollie’s face went numb) and that we were equally interested in better understanding our emotions. 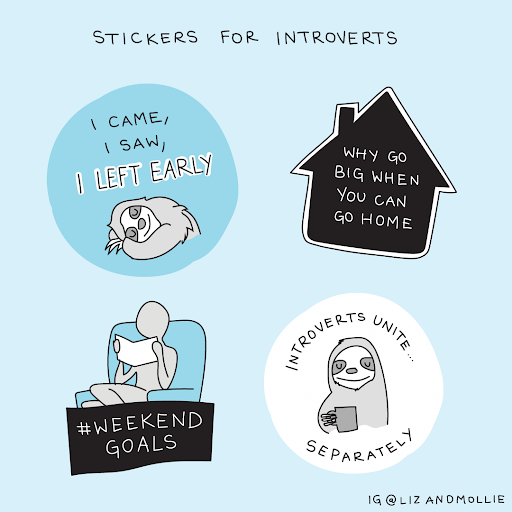 We combined our separate feelings-related research in an illustrated article called “6 Illustrations that Show What It’s Like in an Introvert’s Head”, which was first published on Quiet Revolution. 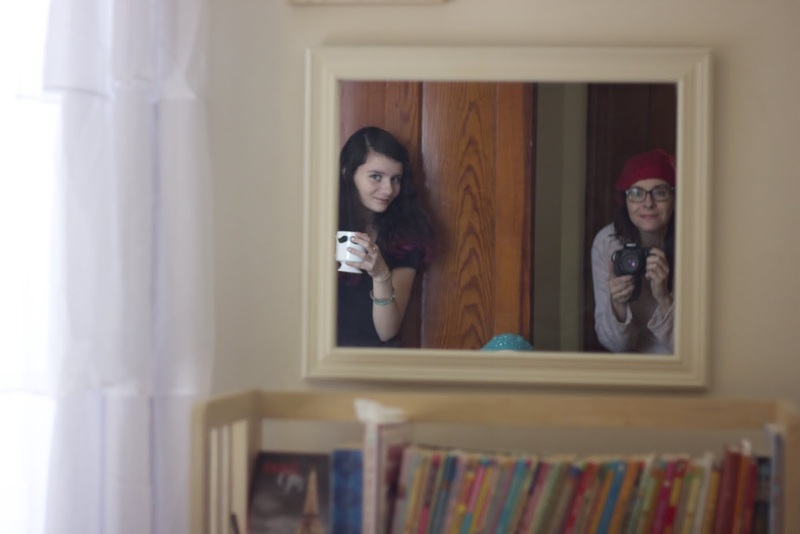 Two things happened: we had a ton of fun working together, and the article went viral. That process made us see collaborating as more than an enjoyable side hobby– it became something that we saw as sustainable, and potentially magical. What are some of the most common workplace issues introverts face? 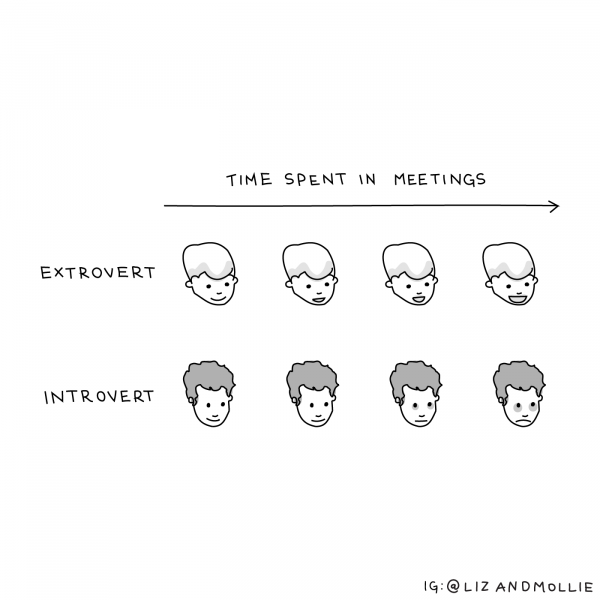 If you’re an introverted leader, you have to handle a lot of social situations, since meetings, 1-on-1s, and work lunches usually make up a large part of your job. To make sure you’re still able to carve out enough time for yourself, we encourage introverted leaders to be open about their preferences. Former CEO of Campbell Soup Doug Conant would give people he worked with a “DRC (Doug R. Conant)” orientation: he would explain that he was an introvert. It helped him “quickly get beyond all the little superficial dances people do when they first start working with each other,” writes Jennifer Kahnweiler in her book The Introverted Leader. Do you have any tactical, workplace advice for managers who want to create better work environments for introverts? Heads down time: Try splitting the day between collaborative and heads down time. During heads down time, each team member has explicit permission to find a quiet place in the office and work by themselves. Walking meetings: As Dr. Jennifer Kahnweiler explains in her book The Genius of Opposites, a walk makes it easier for introverts to talk out their ideas, since they don’t have to make constant eye contact. When they are talking or searching for words, introverts tend to look away from others to reduce visual stimuli so their brains are not as flooded with input. 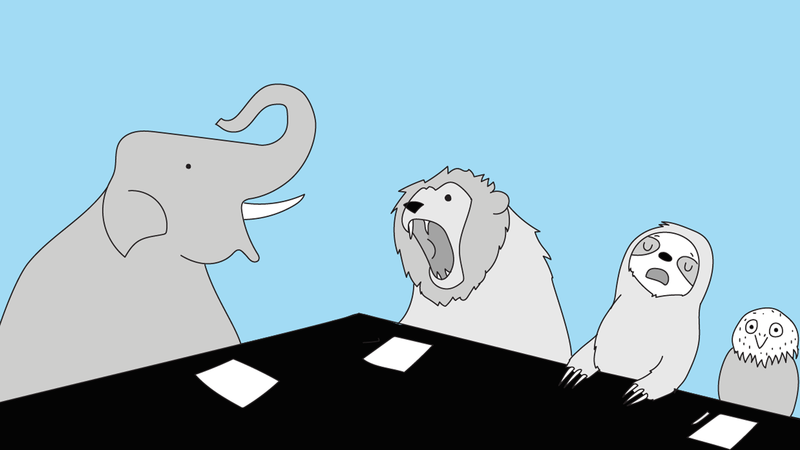 Meeting rituals: Since most meetings are inherently set up for extroverted communication, introverts need to find rituals that make them feel comfortable joining in. According to author Brad Stone, before every meeting at Amazon, Jeff Bezos requires employees to write a six-page narrative detailing their points. 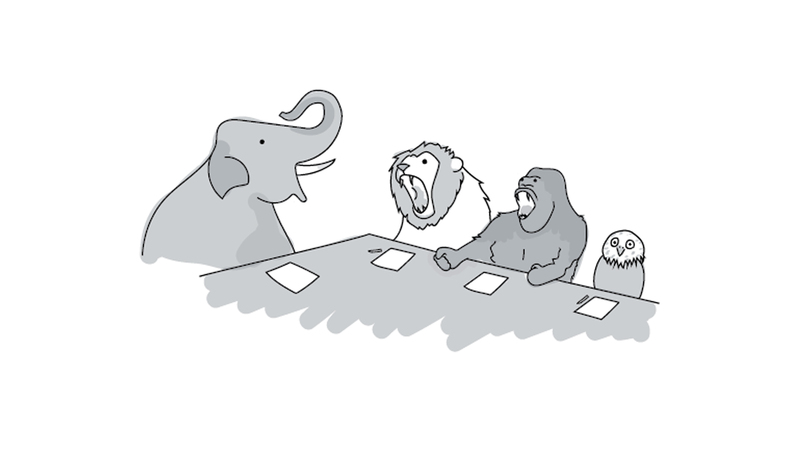 The meeting begins in silence as everyone reads the document. Bezos does this because he believes it both encourages critical thinking and gives introverts time for reflection before the discussion begins. How do each of you recharge after a highly social day? Liz: If I can, I retreat into my minimalist, silent, white-walled apartment that offers almost no sensory stimulation. It’s heaven. If I’m traveling, I try to set aside a night or two to just veg out by myself. I have a whole routine around it: I buy a few snacks and maybe some wine and, when I’m back at my hotel, I immediately put up my hair, change into pajamas, and get into bed. Then it’s reading a book or watching Keeping up with the Kardashians (it’s on all the time and requires zero thought) for the rest of the night. Mollie: If it’s nice out, I’ll go for a long walk alone. The first few minutes I just walk silently, almost like a walking meditation. Then after a few minutes I might listen to music or a podcast while walking. Once I get back home, or to my hotel room if I’m traveling, I lie in the fetal position on a couch or bed and watch mindless TV, preferably a British show. I find those accents so soothing. Liz and Mollie’s new book, from which some of these answers were excerpted, is No Hard Feelings: The Secret Power of Embracing Emotions At Work. You can order now, or subscribe to their monthly newsletter featuring helpful articles, research, and comics. Follow them on Twitter or Instagram @lizandmollie. 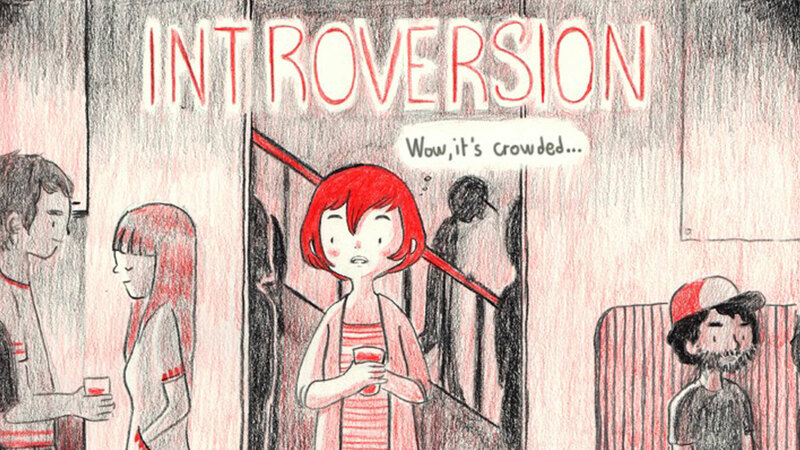 This lovely comic by Luchie perfectly portrays how sometimes an introverts preferences can be misunderstood.